When you’re planning a conference or convention, event signage should be one of the top priorities on your to-do list. After securing the right venue and filling it with guests, your event’s design aesthetic is paramount in ensuring your attendees have a positive experience. While you shouldn’t skimp on a quality venue, you also don’t need to host your event at a five-star resort for guests to have a good time. The right event signage can just as easily transform your environment and impress your guests– at a fraction of the cost. Whether your conference is a company-sponsored event or you’re working for a third-party event planner, the event atmosphere is a direct reflection on you and your business. No matter the event’s purpose or theme, it’s essential to promote your brand. Print your branding or theme on large-scale vinyl banners for overhead mounting on poles or other architectural features at your venue. Getting creative with placement of your graphics and signage is important for setting the scene and making sure the designs really stand out. It’s much easier for event-goers to ignore posters haphazardly dispersed throughout the walls than it is for them to miss visually engaging graphics hanging overhead at all times. You can also incorporate background wall murals or backlit graphics to create a cohesive message and theme. These large-scale visuals will serve primarily to tie the whole event together and give guests an immediate idea about why they’re there. There’s nothing worse than looking for a conference hall, walking into a crowded, unfamiliar venue and having no idea of the event schedule or where to go. Directional signage gives your guests the information they need to navigate unfamiliar environments – and it’s an easy way to make their visual experience more immersive. Instead of taping arrows onto your walls, take your directional signage to the next level by using floor graphics, decals, banners, posters and other wayfinding signage. Lay out a path for your guests by placing temporary footprint decals across the floor, or map out your venue and highlight different products and areas on a wall or ceiling graphic. Get creative by branding your directional signage as well, but make sure each sign is still clear and easy to read. In addition to creating a more unique experience for guests, finding creative ways to display signage can also benefit your brand. Using every inch of your space –and displaying your brand wherever you can – extends your visual ownership of the event throughout the venue. From elevator wraps to branded table tops and stair graphics, there are plenty of opportunities for you to consistently remind guests about your business. Large-scale, creative signage and displays help bring your conference experience to the next level. By partnering with a print solutions provider like SpeedPro Imaging, you’ll have access to industry-leading graphics and signage expertise and products, as well as best practices to create a truly immersive event experience. We don’t just print the visuals for your event. We partner with you to understand all your ideas, and we create a strategy to transform any venue into a coordinated visual experience with big, bold graphics done right. 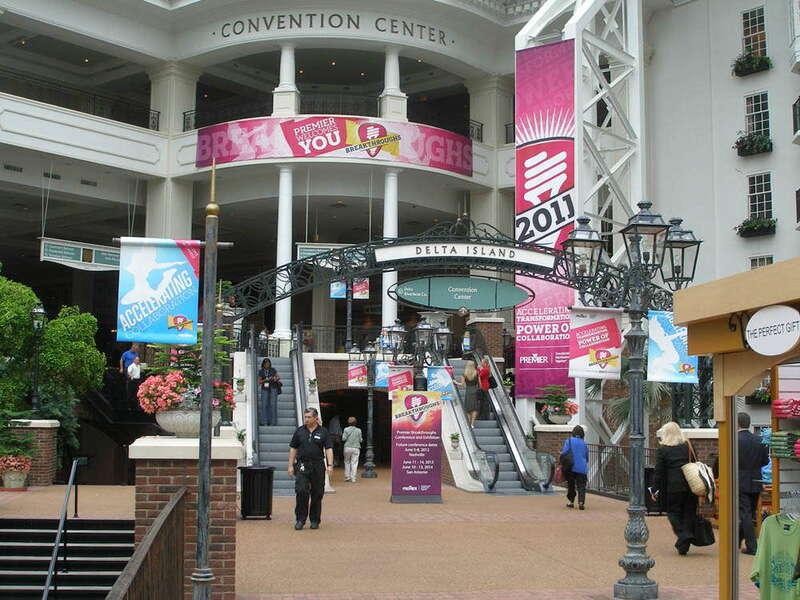 We work with you to create a completely cohesive signage and marketing strategy for any conference or convention. Learn more about the extensive range of conference and event signage solutions SpeedPro Towson has to offer.